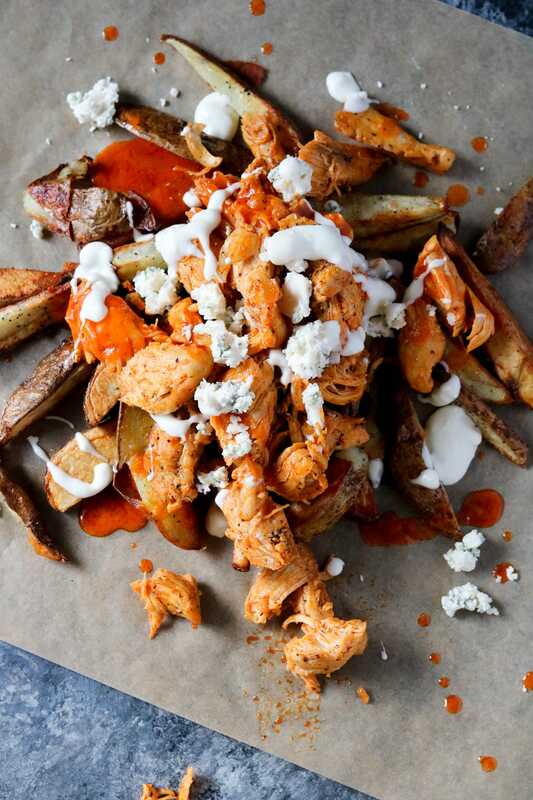 I’m a sucker for anything buffalo chicken, so why not create some homemade buffalo chicken fries?? 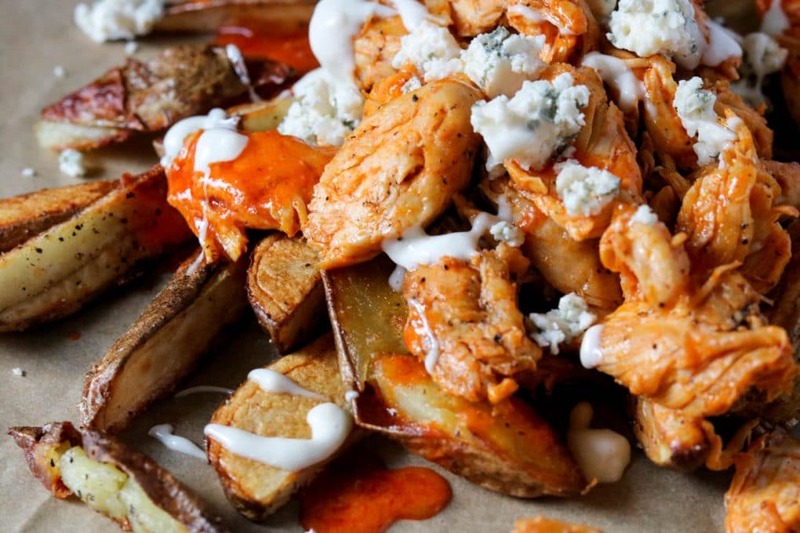 The Super Bowl is coming up and these would make THE perfect game day appetizer. Drizzle on some blue cheese dressing and add some Gorgonzola crumbles, or leave them off if you need a dairy free option. You can munch on these all day long, or at least all game long! Homemade fries are super easy to make, and I always leave the skin on for added flavor and crunch. For the chicken, you can cook in a skillet or grill, whichever you prefer. 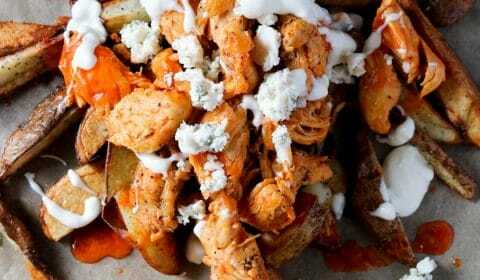 Then simply toss in the buffalo sauce and pile it all together, super simple! My family loves anything buffalo, so of course these went over well. I think I could probably toss anything in buffalo sauce and they’d eat it! Hmmm, maybe I should try some buffalo veggies. Whip these up for the big game coming up on Sunday and be sure to tag Wanderlust and Wellness on social media when you do! Slice the potatoes lengthwise, place onto baking sheet, brush with olive oil and season with salt and pepper. Bake for 30-35 minute or until crispy and browned. Add the Frank’s hot sauce and butter to a medium-sized saucepan and heat over medium-low heat, stirring occasionally. While the fries are cooking, in a large skillet, add 2 tbsp. olive oil over medium heat. Add chicken tenders and season with salt and pepper (or, coat with olive oil, salt, and pepper and grill). Once done, using two forks shred the chicken into chunks. Add chicken to the sauce pan to coat. 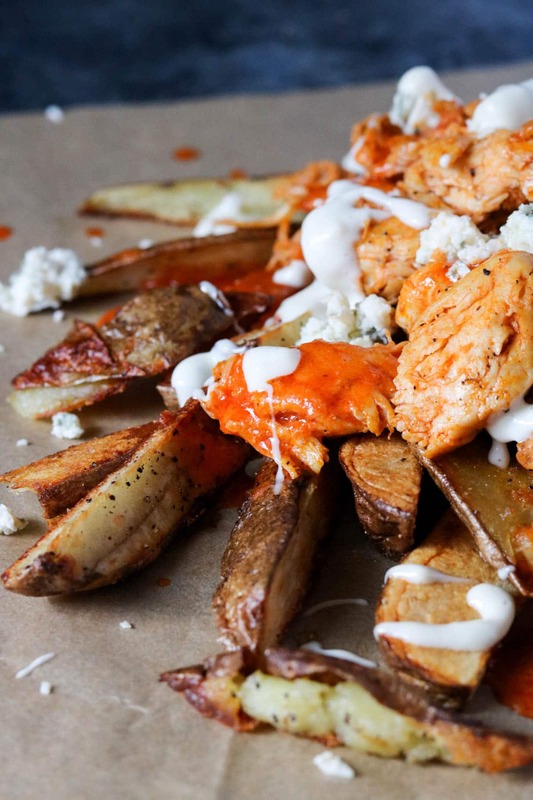 Remove fries from oven, top with chicken, Blue cheese, Gorgonzola and any remaining sauce if needed.